Today’s theological students are tomorrow’s pastors. Roots builds up Christian leadership in Bolivia by investing in the holistic and spiritual development of students in our Generation 4 program. Just as Paul taught Timothy to teach others to be teachers (2 Timothy 2:2), Generation 4 has a strong emphasis on mentoring, so that each student in the program is built up and prepared to also mentor others. This is the multiplier effect of our Generation 4 scholarship program. Each student receives a parcial financial scholarship, quality theological books, participates in Langham Preaching’s expository preaching courses and is mentored by Roots director, Moisés. Students are chosen through a careful selection process and then linked with sponsors. Ideally Roots selects students who are willing to go to remote and regional Bolivia who resources and training are scarce. Roots encourages each student’s local sending church to also support them through their studies. Pablo has decided to give his life to the Lord’s service. He is presently pastoring the youth at a little church in Cochabamba and has just completed the first year of his three year theology degree. Download Pablo’s full testimony by clicking here. It costs just $90 a month to put a student through Bible College. 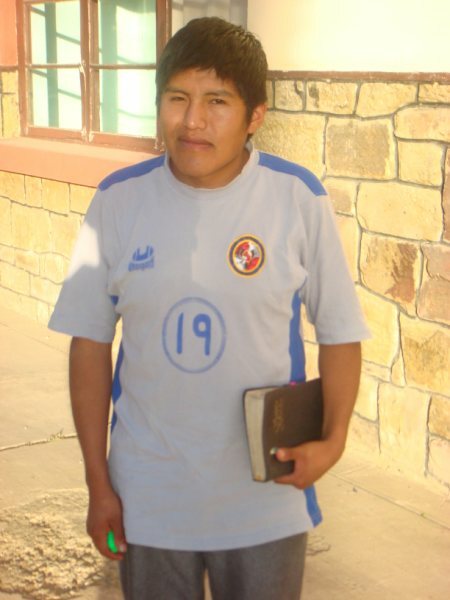 Click here to sponsor a Bolivian Bible college student like Pablo through our Generation 4 scholarship program!